The wars of the past decade have been covered by brave and talented reporters, but none has reckoned with the psychology of these wars as intimately as the Pulitzer Prize-winning journalist David Finkel. For The Good Soldiers, his bestselling account from the front lines of Baghdad, Finkel embedded with the men of the 2-16 Infantry Battalion during the infamous 'surge,' a grueling fifteen-month tour that changed them all forever. In Finkel's hands, readers can feel what these young men were experiencing, and his harrowing story instantly became a classic in the literature of modern war. 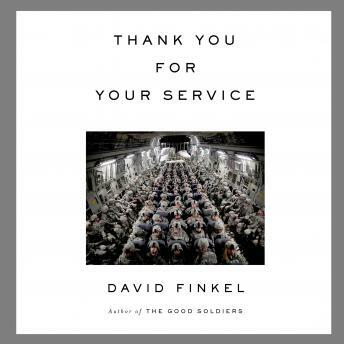 In Thank You for Your Service, Finkel has done something even more extraordinary. Once again, he has embedded with some of the men of the 2-16-but this time he has done it at home, here in the States, after their deployments have ended. He is with them in their most intimate, painful, and hopeful moments as they try to recover, and in doing so, he creates an indelible, essential portrait of what life after war is like-not just for these soldiers, but for their wives, widows, children, and friends, and for the professionals who are truly trying, and to a great degree failing, to undo the damage that has been done. Great book. I really connect to it. The detail on the feeling and emotions is great. only down side of the book is the narrator's inability to produce the emotional effect I think the writer was trying to achieve. very blah. But the writing seems to be personal and deep seeded soulful.